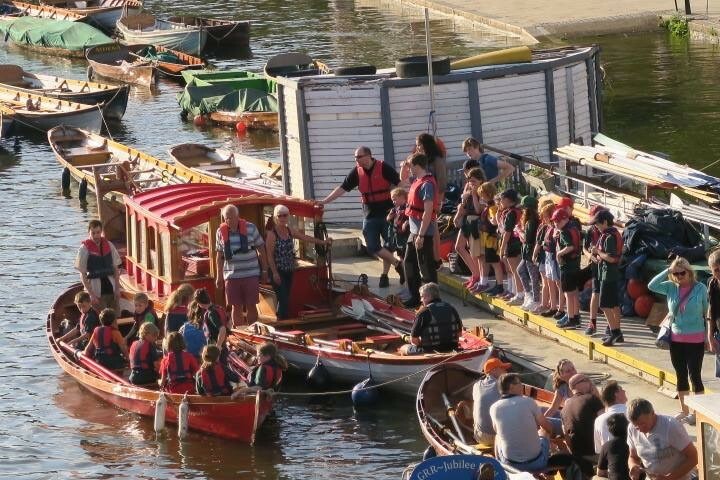 In 2017 The Trust continued to provide a safe and exciting introduction to boating on the Thames assisted by the 14th Richmond Sea Scouts Boating Centre. Jubilant is a fine craft for outings for the most junior or inexperienced rowers, and her accommodation of broad thwarts and walkway down the centre of the boat from the cabin to the bow seat allows for safe seat changes, so many can be inducted during the usual one-hour outings. As in most cases, there are six in the cabin waiting for their turn at an oar. Petersham and Ham Scouts leaders have been training for Scout Activity Permits with the help of the “Jubilant” crew. And have rowed as “Jubilant crew”, to get experience and logged hours, for evening outings involving young people. Scout Permit assessments for pulling up and down the river. Clarendon School is a Special needs school, and we do at least one outing every year, and this year we did an additional special trip for the teachers to recognize their good work, and support for Jubilant. Our clients have included many School, Scouting and Guiding and adult groups during the season.